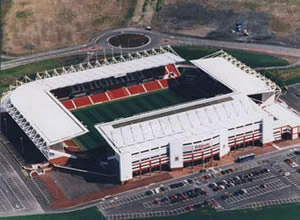 The Britannia Stadium is a purpose built football ground that was opened in 1997, so it has all of the modern facilities that today's stadia have to offer. It has a capacity of 28,000, with options to increase that figure by filling in the two open corners (should Stoke ever reach the Premiership!). The away end has a capacity of 4,500, so any away following can be comfortably accommodated. This also means that away supporters usually have no queues and can sit where they choose. The views are excellent from every angle of the ground (I have sat in every stand except the away end) and there are no obstructions (pillars, etc). As the pitch is below outside ground level, you walk off the concourse onto the stand about 20 ft above the pitch - this is where the disabled facilities are situated, so they also have excellent views - rather than being stuck at the front or in a corner. The catering facilities are also as you would expect from a modern stadium, they sell good quality pies, pasties, sausage rolls, burgers, hotdogs, etc. They also sell the local delicacy - Staffordshire Oatcakes - well worth a try. One word of warning - the food is quite pricey. There are also bars on all concourses serving beer so any supporters arriving early looking for a drink can get one inside the ground. The pitch is large, which is good for footballing sides like Stoke. It also has under soil heating, so it is very unlikely that a game will be postponed due to cold weather. There is also the added attraction of the new statue of our local hero Sir Stanley Matthews, which is situated at the north end of the ground, behind the 'Boothen End'. It was unveiled by Kevin Keegan on the 27th October 2001, and shows Stan in three stages of his footballing career - Well worth a look. Exit the M6 at junction 15, and take the A500 to Stoke-On-Trent. After a couple of miles, the road splits into FIVE lanes. Follow the middle lane, up the hill, onto the massive roundabout. At the roundabout, take the second left onto the A50 following the signs for Derby/Uttoxeter (The stadium is sign posted, and visible from here). Continue along the A50 and the stadium is on the right. For fans with Club car park tickets they should leave the A500 at the first exit, travel south on the A34 (signpoasted Stone/Stafford) at the first roundabout, turn left into Longton Road. The entrance to the club car park is on the right. There is a large car park at the stadium but beware if you want to park here, you will need to pre-book a car park ticket from the club. Supporters allowed as long as there are no club colours. Good food served, right next door to the Britannia. Bar attached to the local outdoor 5-a-side centre. Not to sure on the deal for away fans, or even if supporters are allowed in. In Stoke town centre itself. Wouldn't expect people with club colours would be allowed to eat inside. The Poachers Cottage is located on the on A34 (Trentham ) is apprix ¼ mile from official club car park entrance. If you are a registered user then you can login, and create your own personal review of Stoke City Football Club - The Britannia Stadium. These reviews can be private or public.